Looking for a way to ensure you have a weekly supply of fresh, local food? Subscribe to a CSA. Short for “Community Supported Agriculture,” a CSA enables you to buy a share of a farmer’s crop by paying an upfront fee. Your fee purchases a “share” from a local farm and you receive a box of farm-fresh produce every week during the growing season. 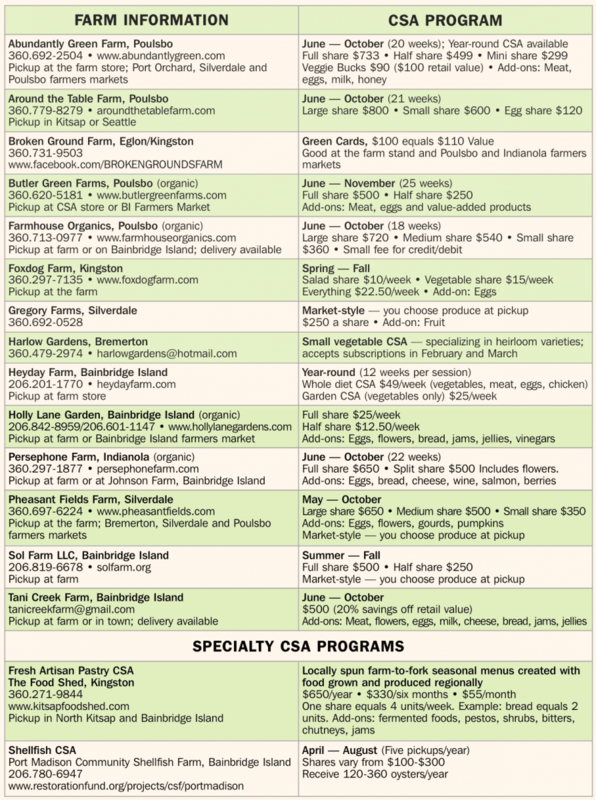 CSA fees are typically paid in early spring, providing farmers an infusion of cash to help cover anticipated expenses and pay for things like seeds, fertilizer and equipment. In exchange for your financial support, you receive a portion of the farm’s bounty throughout the growing season. CSAs first began in Japan in the 1960s when a group of women concerned about an increase in food imports went directly to farmers and purchased a year’s worth of food. “Teikei” in Japanese, or “putting the farmers’ face on food,” the CSA movement rapidly caught on in Europe and by 1985 the first CSA began in Massachusetts. 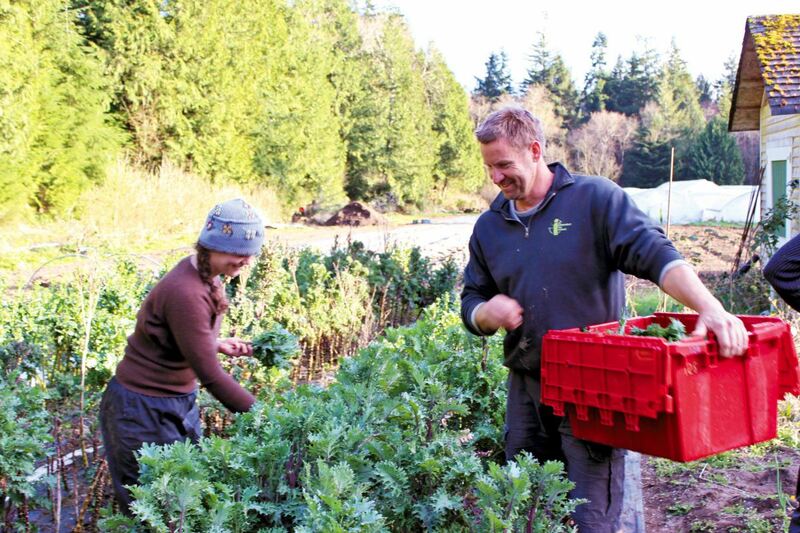 Persephone Farm in Indianola pioneered the first CSA in Kitsap County not long after, in 1991. 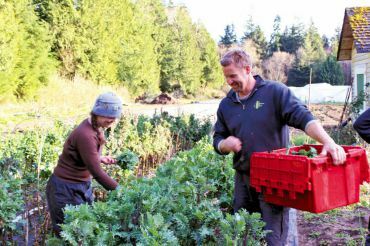 Kitsap is blessed with a diversity of CSA offerings ranging from small programs (only 15 shares) to large (100-plus shares). There are many options and flexibility about what subscribers receive every week, and where and how it’s delivered. 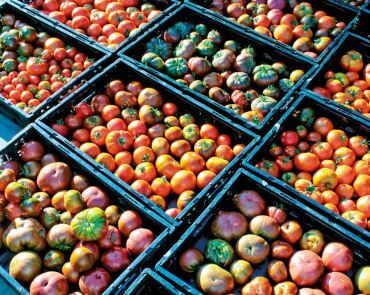 Some CSAs deliver boxes to the subscriber’s home or a central pickup location like a farmers market; others require on-farm pickup. Some are produce only; others offer add-ons, like eggs or flowers. Some have installment-payment plans; others require payment upfront at the start of the season and still others offer weekly or pay-as-you-go options. 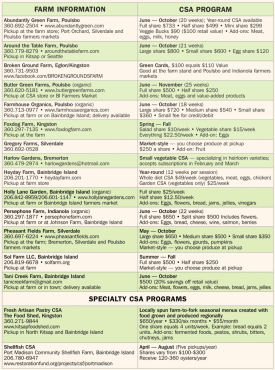 Several local farms run early-bird specials in January or February on their subscriptions and they take most forms of payment including cash, check, PayPal and credit/debit cards. Note that there may be a small fee for credit or debit card processing. 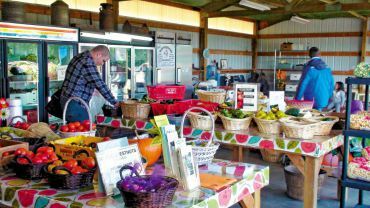 Several local farms also accept EBT and SNAP payments. What comes in a CSA share? Over the course of the growing season, you can eat the alphabet, from artichokes to zucchini and every conceivable vegetable in between. In addition to vegetables, many farms now offer add-ons like locally grown beef, lamb, pork or chicken, dairy products, eggs, baked goods, honey and value-added items like jams, jellies and pickles. A farm may put together your CSA share for you or offer “market-style” where you assemble your share, choosing the vegetables you prefer. 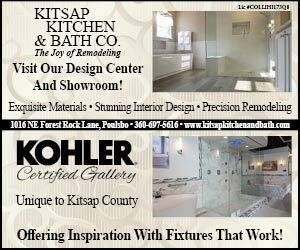 Kitsap even has a couple of specialty CSAs that offer shellfish and local baked goods and pastries. How much food will you get and will you even know what to do with it? You may see some unusual or new-to-you vegetables in your share — that is part of the fun of a CSA. Many farms include recipes to help you try out these new foods. Typically a large share feeds a family of three to four members and a small share, about two or three people. The CSA season usually starts in late May or early June with fresh spring greens, rhubarb and berries and finishes in late October or November with hearty root vegetables, squash and onions. Several local farms offer winter CSAs, year-round programs or “whole diet” CSAs with meat, eggs, dairy, grains and vegetables for one-stop local food shopping. Joining a CSA is easy. Select one that interests you. Take into consideration things like farm location, the size and price of the share your family will need, delivery or pickup options, growing practices as well as add-ons. Visit the farm website — you’ll find plenty of information to help you choose what works best for you. 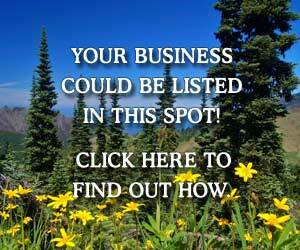 Finally, contact the farms via phone or email to make your final decision and purchase. Many even offer online registration. 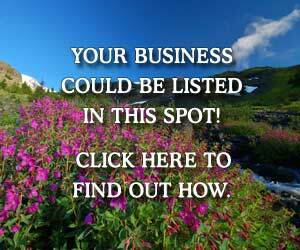 Don’t delay because many farms offer a specific time frame, i.e. a 20-week growing season. As more and more consumers are using CSAs, you’ll want to sign up as soon as possible. Farming is a risky business and it is important to know that when you buy a CSA, you are sharing both the risk and the bounty with the farmer. Bad weather and pesky insects are only a couple of the things that can plague growers. 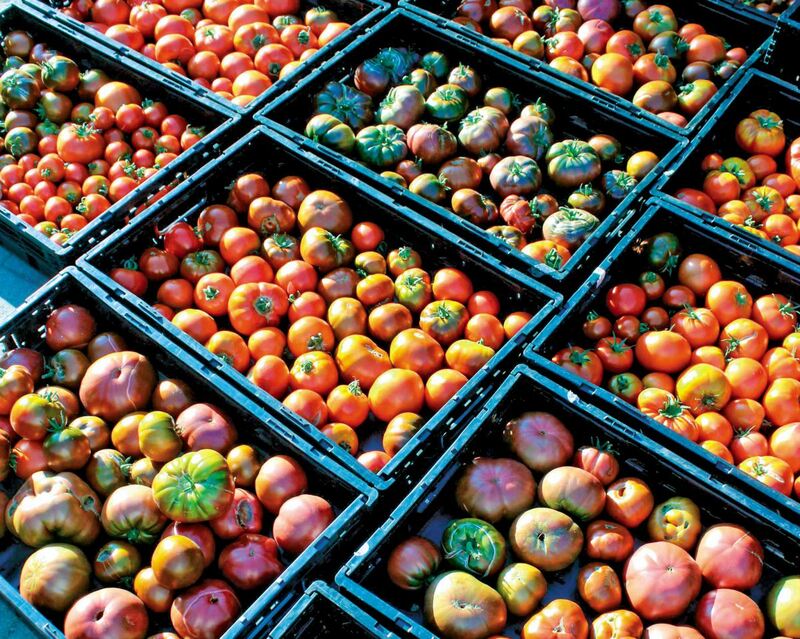 Fortunately, Kitsap farmers grow a diversity of crops, so even if one fails, another will prosper and fill its place. A final note on farm etiquette: If you pick up your CSA at the farm and want to take a look around, check with the farmer about the visitor policies. Part of the excitement of subscribing to a CSA is meeting the farmers, getting to know them and seeing their farm. Children especially enjoy visiting farms and learning more about where their food comes from. However, it is important to respect a working farm. Some farmers love having subscribers tour the farm and even schedule special events or activities on CSA pickup days while others would rather you make an appointment. Check with the farmer before wandering around. A CSA program is truly a win-win relationship. You get to know your farmer and get peak-of-the-season local farm produce. You build a personal connection with your food and the land on which it was produced, and help maintain productive local farmland as open space. CSAs also support a strong regional food supply and strengthen our local economy.